Relax by the oversized private pool (one of the largest on the island!) 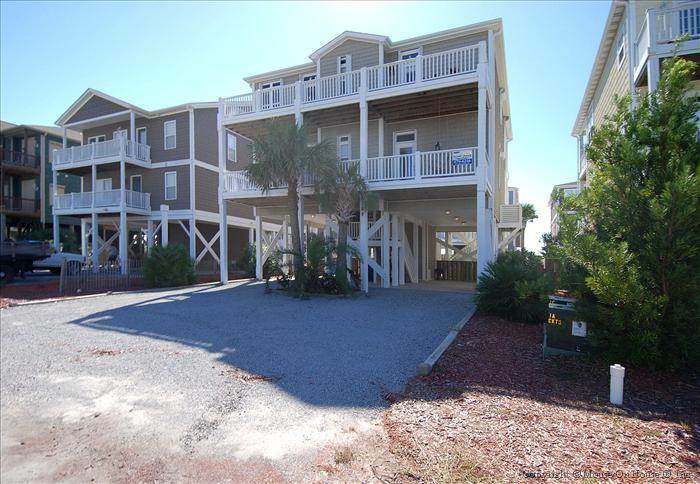 as the palmetto palms gaze over you or take a quick walk to the beach to soak in the sun, dig your toes into the warm sand, and view the spectacular surf. CLICK on the photos and scroll through and also click on the floor plan to preview more of this home. This wonderful 6 bedroom 5 bath home with reverse floor plan that offers ocean views from the top deck includes an abundance of amenities: free high speed internet access, ceiling fans in all the bedrooms as well as direct deck access, 7 televisions (48" flat screen in main living area), 4 DVD players and expanded cable, washer/dryer, outside shower and poolside charcoal grill. Extra-large decks (2 front, 2 rear), new outdoor patio and poolside furniture to accommodate 26. Renters storage available under the house. For the culinary artist, a magnificent kitchen awaits with a large electric stove, oven, microwave, Stainless dual refrigerator/freezers, dual dishwashers and generous granite counter space. Down: Queen, Queen/Queen, Queen/Single, Double/Single Bunkbed. Parking for 9 cars. NON SMOKING!